A well-deserved favourite with Sofia’s beautiful people, this attractive bar boasts all the usual hallmarks of the hip city nightspot: that is to say, bare brickwork, squashy sofas and designer lampshades. 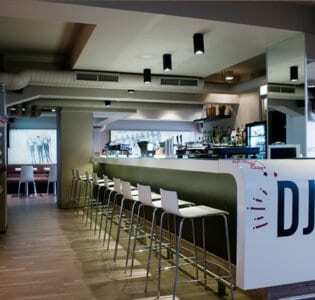 It is a cavernous space, much in demand as an eating spot by day, even more popular as a cocktail spot by night. What first strikes you about the latter is what a a large menu of cocktails and spirits (including the potent Slavic spirit Rakia) they have. They also offer three excellent Shirley Temples, the pick of which is the Pomegranate Strawberry Delight. Lest you this review is a mere encomium, then we ought to point out that the service can be a bit hit and miss affair, particularly so when it is busy. Furthermore, there doesn’t appear to be a House Cocktail. Gripes aside, the atmosphere, setting and general air of laid-back luxe more than makes up for any shortcomings on this score, as indeed does the food. There are salads aplenty and some hey main courses, including such delights as blood sausage polenta and that Bulgarian staple Chicken Tikka Masala. It’s a lively, exciting place that stays open late into the night with DJs playing most weekends. To its long list of charms we must add its leafy garden. A handsome Beech tree grows in the middle of it under which it is sheer bliss tossup a cocktail or two. If the heavens open, you can always beat a hasty retreat to the conservatory, a not unattractive glass box, handsomely appointed with chairs, tables and oak floors. It’s a lively, exciting place that stays open late into the night with DJs playing most weekends.